I always expected that my book on the Irish scholarly presence at the monastery of St. Gall would elicit critical responses. This is not to say that I do not prefer compliments and positive appraisals, but I am fully aware that my analysis of the spread of Hiberno-Latin scholarship on the Continent ruffles the feathers of those colleagues who would rather emphasise the Irish element of the intellectual achievements by Irishmen. Those on the nativist side of the spectrum can be troubled by my assessment that not all that glitters is (completely) green and that we can learn more about early medieval intellectual history when we include all possible factors that promoted and shaped Irish learning, and curb our modern impulses to classify everything along national(ist) and ethnic lines. Professor Ó Cróinín’s review in the Journal of British Studies is the first review of my book I have read so far1Update: another review appears to have grasped the central thesis of the book better. and it is decidedly negative. In the conviction that a (negative) review need not be the end of the academic conversation, but rather a continuation, I gladly take this opportunity to respond to some parts of his short review. For while I do not expect to convince Professor Ó Cróinín of all of my conclusions, I do think it is important to point out where the review does its readers a disservice by misrepresenting my argument. And unfortunately it does so repeatedly and consistently. My approach tests two assumptions often expounded, implicitly and explicitly, in earlier scholarship: 1) that St. Gall acted as a bridgehead (or gateway) of Irish scholarship, meaning that it was at St. Gall that Irish texts made landfall and that this monastic centre had a ‘special relationship’ with Ireland, and 2) that the scribes and masters at St. Gall were always aware of the Irish heritage of the material before them, or that they (always) appreciated it because of its Irish credentials. In both cases, my findings qualify these assumptions: I found that much of the Irish material came to St. Gall via other continental centres, rather than directly from Ireland, and was graciously received by St. Gall scholars but often without being aware of (or particularly interested in) its Irish background. As I stated in the conclusion, this thereby only underscores the value accorded to the Irish works for their practical use or intellectual quality. This point seems to have been lost on Ó Cróinín. I am interested to learn how this paragraph testifies to the intent to minimize Irish influence. I do not see it. To me, but I expect also to other readers of the review, it would have been instructive to learn how, in Ó Cróinín’s eyes, I misinterpreted early medieval evidence, leading me to paint an erroneous picture. Ó Cróinín does not offer us any such observations. Instead, he repeats his original claim a number of times, stating how my book tries ‘to conjure’ evidence ‘out of existence’ (see below), engages in ‘relentless denigration’ and displays a ‘steady drumbeat of anti-Irish bias’. This seems to be exactly the function of that first sentence: to disqualify the book without need to analyse its contents. Actually, there is one supposed misreading on my part to which Ó Cróinín directs attention, namely my remark that the surviving sections of the Vita S. Galli uetustissima ‘make no reference to Ireland or to Irishmen’ (p. 19). I honestly do not know what Ó Cróinín is aiming at here. The full sentence from which he quotes a fragment is: ‘The surviving sections make no reference to Ireland or to Irishmen and we find no instance of geographically identifying words such as hibernia, scotigena or even scot(t)us in the entire text.’ This sentence comes at the end of a paragraph which explains how only fragments of this the oldest known Life of Gallus —now wonderfully published by the abbey press—survive on two mutilated ninth-century bifolia and how the missing parts probably include a large chunk of what would have been the opening of the text, where one would expect an exposé of Gallus’s origin and his travels with Columbanus (at least, that is what we find in the same place in the two Carolingian recastings of the Life). Due to the fragmentary nature of the extant life, we can never know the exact content or tone of the original opening of the uetustissima. I fail to see the factual error in this statement. The ensuing observations in Ó Cróinín’s review are even more puzzling and no longer point to supposed factual errors or false interpretations. Instead, on the subject of the fascinating list of books written in Irish script—Libri Scottice scripti—, he comments that ‘not even Meeder’s reductionist approach can conjure this list out of existence—though that is not to say that he does not try.’ I am at a loss here: how do I try to negate the existence of this list, when I write ‘this list of books is an important, but complicated, witness to the relations between Ireland and St. Gall’ (p. 55)? Surely, I am not the first to address to the complications of this list, asking questions such as: why were the titles on the list not present in the catalogue proper? Could these books have included volumes in Anglo-Saxon script? In fact, Johannes Duft is much more blunt in his assessment of the books listed as ‘out-of-date’, ‘mostly unreadable’, ‘with no practical and direct importance’ to the St. Gall monks, and possibly including Anglo-Saxon books.2Duft and Meier, The Irish Miniatures in the Abbey Library of St. Gall, pp. 41-2 It makes one wonder: would Ó Cróinín suggest that Johannes Duft—the eminent erstwhile St. Gall librarian-—set out to minimize the Irish contribution to St-Gall? Equally puzzling is Ó Cróinín complaint that ‘while Meeder does write about the famous mid-ninth-century Irish scholars Marcus and his nephew Móengal (Marcellus), […] their influence, too, is minimized as much as possible, by subsuming it into a discussion of other (occasionally fictional) Irish visitors’. 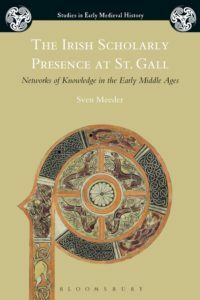 This seems a case of damned if you do, damned if you don’t: I covered all the evidence of Marcus and Móengal’s presence at St. Gall and, at one point, remark that ‘the contribution of the Irish Marcus and Marcellus to St. Gall’s intellectual networks […] was greater than the simple conveyance of books’. Such qualifications seem at odds with a book that is ‘relentlessly denigrating’ Irish scholarly influence. Furthermore, I would never conclude from the (sometimes sparse) evidence of Irish visitors to St. Gall that some of them were therefore ‘fictional’ (I have no reason to believe they are); perhaps Ó Cróinín could explain why he ‘conjures’ these men ‘out of existence’? But this nuance, again, seems lost on Ó Cróinín. The scholars and scribes of St. Gall actively sought to acquire and copy the scholarship that they found within their intellectual network: in their selection, the background (e.g. Irishness) of these texts took a backseat to practicality, intellectual value, and other concerns. The late ninth-century glosses in the breviary of St. Gall’s books (MS 728) testify to critical minds reflecting on the past indiscriminate acquisition policy of the monastery as a process of hit-and-miss. We can only be thankful to those earlier monks who were so eager to copy the scholarship that came within their reach. I have not missed the subtle praise at the end of the review for almost the entire second half of the book as an ‘otherwise useful discussion of the St. Gall transmission of the important Irish texts De XII abusiuis saeculi (65–82) and the Hibernensis (83–98), as well as the St. Gall copies of the various penitentials, Irish and non-Irish (99–108).’ I appreciate these words. But I cannot pretend Ó Cróinín’s review is not a little frustrating. Here’s the thing: personally, I am in constant awe of the achievements of the Irish scholars of the early Middle Ages and convinced of their formidable influence on European culture. But my appreciation was not the topic of my study; the book focuses on how the monks of St. Gall appreciated Irish scholarship and how the Irishness impacted on its distribution and reception. It is frustrating that this central element did not get across to a valued and admired colleague like Prof. Ó Cróinín. It is the duty of the author of a book to write precise, clearly and well-argued and I welcome any criticism that may help improve my future work. In my view, the onus is on the reviewer to read carefully. In this case, I think there is some room for improvement on that score. Historians of the early Middle Ages daily tackle complicated, technical sources in foreign, defunct languages and apply subtle sociological and anthropological methodologies in order to shed more light on the societies of old as well as more universal cultural and societal approaches and mechanisms: such as ‘othering’, ‘identity formation’, and the ‘use of the past’. Sometimes the insights of such specialised studies seem slow to reach a wider audience, even though they may be highly relevant. The upcoming release of the Dutch film Redbad: the legend provides an promising opportunity to share some of our insights with a general public, not least because the film itself seems to be a prime example of using the past to gift-wrap a contemporary, political message. 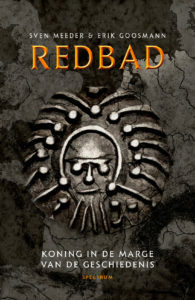 Redbad (or Radbod as we encounter him in the sources) was a Frisian leader who both battled with the Frankish mayor Pippin II and managed to integrate extremely well in the ruling Frankish family; while he himself did not seem to have converted to Christianity, he did provide welcoming work environment for missionaries like Willibrord and Wulfram (as long as this was politically beneficial to Radbod, that is). This nuanced image of Radbod is somewhat obscured by the primary sources, which all date from at least some decades later and were all written by Carolingian apologists, who found in Radbod a suitable candidate for their ancestors’ heathen arch nemesis. Academic scholarship has uncovered the much more nuanced reality, but the film makers opted to present this history in a rather uncreative, dualistic version: Radbod as the freedom-loving champion of a ‘northern culture’ fighting against ‘southern religious extremists’. Sounds like a familiar message? April saw the publication of my book on the Irish scholarly presence at St. Gall with Bloomsbury Academic publishers. The cover is certainly wonderful and I can only hope that the reviewers feel that the content matches it. To give you some idea of the argument of the book, I am including the final version of the brief conclusion of the book here. The glosses that were added to the breviary of St. Gall’s books in the last decades of the ninth century are testimony to the voracity with which the community had obtained its scholarship. In their urge to acquire learned texts, the monks of St. Gall had hit a number of misses, so the later annotator recorded. Especially among the texts of purported patristic writers, he found false, mendacious and useless works. While the later annotator appears to have had the leisure to thoroughly examine the books in the library, the earlier copyists and book buyers were simply too eager to collect authoritative texts and too time-pressed to inspect closely what they were about to acquire. These unique glosses paint a picture of a bustling and vibrant blooming of intellectual energy that distinguished the Carolingian revival of learning. Networks of knowledge were buzzing with activity and scholarly exchange. With its focus (mainly) on a few manuscripts, written at or brought to the Alpine monastery of St. Gall, and containing scholarly material originally composed in Ireland, this book only covers a tiny detail of the prodigious intellectual phenomenon that was the Carolingian revival of learning. Nevertheless, this study represents an attempt to offer a contribution towards a better understanding of the intellectual boom of the eighth and ninth centuries. Rather than taking a top-down approach and attempting to explain the situation ‘on the ground’ from the well-expressed ambitions of a distant court, it aims to present a ‘horizontal’ model for the enquiry of intellectual contacts between St. Gall and other learned centres. And despite its modest scope, this book has tried to demonstrate that, when studied closely, a history painted with broad strokes can prove to be deceiving. Thus, whereas the numerous surviving products of Irish learning in the library of a monastery with an Irish patron saint would suggest the existence of a singular connection between the monastery and Irish scholarship, or a gateway function connecting Ireland with continental Europe, a more detailed look presents us with a different picture altogether. The turbulent and creative years of Carolingian renovatio formed the circumstances in which Irish learning was spread over the continent, where they were read, copied, redacted or ransacked with vigorous creativity. The community of St. Gall managed to collect a sizeable corpus of Irish scholarly works with some of the most influential texts from Ireland: De XII Abusiuis, the Collectio canonum Hibernensis, Ailerán’s exegesis and Irish penitentials. The monastery was no stranger to Irish influence. It appears that a modest, but steady stream of pilgrims visited Saint Gallus’s grave among the many travellers seeking to cross the Alps into or out of Italy. The Irish learned texts were, however, obtained through other channels. The study of the extant manuscript witnesses to Hiberno-Latin scholarly texts at St. Gall reveals evidence (sometimes circumstantial) for intellectual connections with nearer, continental centres. Especially north-eastern France and central and southern Germany – and of course Reichenau – seem to have supplied St. Gall with Irish scholarship; and vice versa. By the time it arrived at the monastery of St. Gall, it had often already gone through a number of continental or Anglo-Saxon hands: an Anglo-Saxon by the name of Eadberct had been able to put his stamp on a version of the Hibernensis; De XII Abusiuis was already employed to fulfil a role in a continental, political dispute; the preface to Cummean’s penitential was already appropriated for use in a continental penitential composition. The monastery of St. Gall did not fulfil the role of bridgehead, connecting Ireland with the continent, nor was it any more of a gateway than other continental centres within the Frankish realms. If metaphors are necessary, St. Gall acted more as a sink strainer. With the streams of scholarship rushing through St. Gall, an impressive number of Irish works were trapped by its monks in their nets. Partly thanks to the cupidity of the St. Gall monks, partly owing to its convenient location, and partly due to the fortuitous survival of so much of the library’s holding, we have this unique collection to study. None of this, of course, diminishes any of the creative splendour of the Irish scholars who produced the learned masterpieces. On the contrary, the rich evidence of continental appreciation and appropriation, and the dynamic redistribution of Hiberno-Latin scholarship between continental intellectual centres only underlines the fact that Irish learning was valued greatly by its continental recipients for its skill, sagacity and utility. It was these qualities rather than any value automatically attributed to ‘Irishness’ that ensured its place within the pan-European pool of learning. The medieval spread and reception of scholarship was, ultimately, an exercise in cultural exchange in which both the ‘sender’ and the receiving party influenced the scholarly product that was shared. The transference of a cultural object from one context into another by necessity transforms its meaning. By the time Irish scholarly works arrived at St. Gall, they had already gone through a number of such semantic transformations. While the Irish background is important for historians to understand the context of the works’ conception and original composition, we cannot assume that this background was equally significant for the St. Gall recipients. In fact, one can justifiably wonder whether the St. Gall monks always knew the origin of the Irish texts they copied, read and taught (and whether they cared). Similarly, the meaning and relevance of Irish works of learning must have been different for the community of a continental monastery than for its Irish author and initial Irish audience. In fact, one could argue that the Irish scholarship became ‘more continental’ (or rather ‘more European’) with every step of its dissemination beyond the shores of Ireland. This ‘globalizing’ trend is, after all, the hallmark of the most durable of scholarly expressions. And the durability of Irish learning is not in doubt. “Historici verbazen zich over de nieuwe ’beeldenstorm’ die over Nederland raast”, schrijft de Telegraaf op 17 januari. Dat lijkt mij sterk; historici zouden moeten weten dat het herwaarderen van de geschiedenis een verschijnsel van alle tijden is. Sterker nog, dit ‘gebruik van het verleden’ was de afgelopen decennia een belangrijke stroming in het historisch onderzoek. Verbazing is dan niet de meest voor de hand liggende reactie, maar dat de emeritus professoren Emmer en Ankersmit geïrriteerd zijn, dat geloof ik wel. Maar daar is geen goede reden voor. Er wordt namelijk niet ‘gefraudeerd met de geschiedenis’, zoals de kop doet voorstellen, er wordt alleen maar anders omgegaan met de geschiedenis. Dat een school J.P. Coen niet langer op een voetstuk wenst te plaatsen is nogal logisch gezien zijn geschiedenis van wreedheden. Die geschiedenis moet niet vergeten worden, integendeel, maar Coen hoeft ook niet gevierd en geëerd te worden met zijn naam op de gevel een school. En het is alleen maar goed dat we niet alleen herinneren dat Johan Maurits het Mauritshuis heeft laten bouwen, maar ook dat hij een rol in de transatlantische slavenhandel had. Zo wordt voor iedereen duidelijk dat historische personen gewoon mensen van vlees en bloed waren, en dus veel complexer dan helemaal goed of helemaal fout. Een naamsverandering van een school of de verplaatsing van een buste naar een andere zaal is natuurlijk geen censuur. Het rekent af met een onvoorwaardelijke heldenverering sinds de negentiende en vroege twintigste eeuw. Het verschaffen van context maakt geschiedenis uiteindelijk veel interessanter dan wat simpele verhalen over helden en schurken. Networks of Knowledge (NoK) and Networks and Neighbours (N&N) are two projects dedicated to interrogating social, political and intellectual connectivity, competition and communication between persons, places and things in Late Antiquity and the Early Middle Ages. We are excited to announce that we have come together to bring you an international, interdisciplinary conference on social and intellectual networking in the Early Middle Ages. The conference aims to explore the existence, performance and sustainability of diverse scholarly, intellectual, social, and material networks in early medieval worlds. We will engage manuscripts, artifacts and theories over several panels framed by two categories: people and history and ideas and society. The first references networks of scholars, thinkers, writers, and the social and political histories related to their productions. The second imagines the transmission of ‘knowledge’, as information, as rhetoric, as object, and as epistemic grounding. In addition, we will have a dedicated panel for interrogating the applicability of social network theory for early medieval studies. Selected 30-minute papers will investigate the theoretical possibilities and problems of researching early medieval networks, attempt to re-construct historical networks, critically analyse ‘information’, and/or contribute in diverse ways – theoretically, methodologically, and epistemologically – to our understanding of early medieval connectivity. The symposium is set up in such as way allowing ample time for discussion and active participation of the audience. Assigned moderators, who will have pre-read the papers, will ensure thorough discussions following the papers. The programme is now published! The conference is entirely free and open to anyone, but in order to make accurate catering bookings, please register your interest at conference@networksofknowledge.org (preferably before 1 August). The earliest form of European law is canon law, the first body of legal texts with ambitions to universal applicability for all Christians in the West, regardless of geographic, political or social boundaries. From the fourth century onwards we observe a steady growth in the involvement of individual Christian clerics and church councils in the making and codification of law. Early medieval canon law collections, rulings of church councils, Papal legislation (in the form of letters), and penitential literature, far outnumber the surviving legislation issued by early medieval kings. Canon law, and especially canon law collections, was also much more sophisticated: it drew upon a wide array of sources, it benefited from the debate culture of church councils, it often sought to have a universal rather than local appeal, and it can be seen to interact with various European vernacular laws, some of which are couched in pre-Christian traditions. Canon law is an especially important historical source because the dialectic process through which it was formed allows us to gauge the way in which different contemporary cultural traditions could be fused and eventually forge new identities in the period of transformations from late Antiquity to the early Middle Ages. However, many of the essential scholarly publications in the field of early medieval canon law are now over a century old. Despite being meticulously researched, they are extremely technical and are all but impenetrable to non-specialists (many are written in Latin). Moreover, many of the sources necessary to study early canon law remain unedited and available only in manuscript. The impenetrability/unavailability of the sources and resources for the study of early canon law led, in the twentieth century, to the subject being generally neglected by early medieval historians. Late antique and early medieval canon law are still considered rather obscure subjects today. Yet, few would argue with the statement that religious and ecclesiastical law was of the highest importance for the literate (mostly clerical) elite throughout the Middle Ages. A better understanding of the dynamics within the genre therefore will not only elucidate the scholarly context of these intellectuals, but the insights gained from the study of these canonical texts can also be brought to bear on the development of western thought more generally. The Collectio quadrigentorum capitulorum, the Collection in 400 chapters (or: Collectio 400 from hereon) has caught my interest some years back and it has continued to intrigue me. There are several reasons for it, but one must be Friedrich Maassen’s remark on the collection in his 1870 important work Geschichte der Quellen und Literatur des kanonischen Rechtes that the arrangement of this seemingly very sophisticated systematic collection is ‘ohne Plan’, – ‘without a plan’ – observing that the text abruptly jumps from one subject to the other. Hubert Mordek confessed that ’with the best will in the world’ he could find no system in this systematically arranged collection either. Reconciling the obvious richness in source material available to the compiler of the Collectio 400 with its perceived disorganisation offers a very attractive challenge. 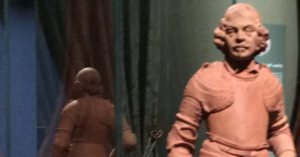 But just as challenging, as I found out, is the puzzle of identifying the collection’s sources and their provenances, and digging deeper it produces more insular connections than obvious at first instance. Before exploring these connections, though, let me first very briefly introduce the Collectio 400. The canonical collection named ‘Die Sammlung in 400 Capiteln’ by Friedrich Maassen (in one of his less inspired moments) is one of the many products of the vigorous canonical activity of the eighth and ninth centuries. It is a systematically arranged collection featuring just over 400 chapters comprising ecclesiastical rules from a wealth of sources ranging from Roman secular law, ecumenical councils, papal letters, Gallic synods, Irish and Anglo-Saxon penitentials, to theological treatises and, importantly, the Bible. 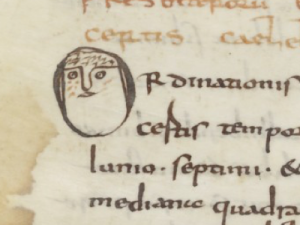 This poignant lesson was left in the margin of manuscript BnF lat. 2316 for future generations to ponder over. Finding codicological notes on the internet when you find out that you need to know more about a particular manuscript but are hundreds of kilometers removed from it, can be a very joyous occasion. At least, that is my experience. In that spirit, I put some of my findings online on Paris, BnF lat. 2316, one of the three extant manuscript witnesses to the Collectio 400 capitulorum. The ninth-century part of the manuscript (it is bound with a 25 twelfth-century folia) contains a fragment of the canon law collection known as the Dionysiana (fols. 26-84), the aforementioned Collectio 400 capitulorum (fols. 84-120), a fragment of the Breviarium apostolorum (fols. 120-1), some chapters of the Council of Aix-la-Chapelle of 801 (fols. 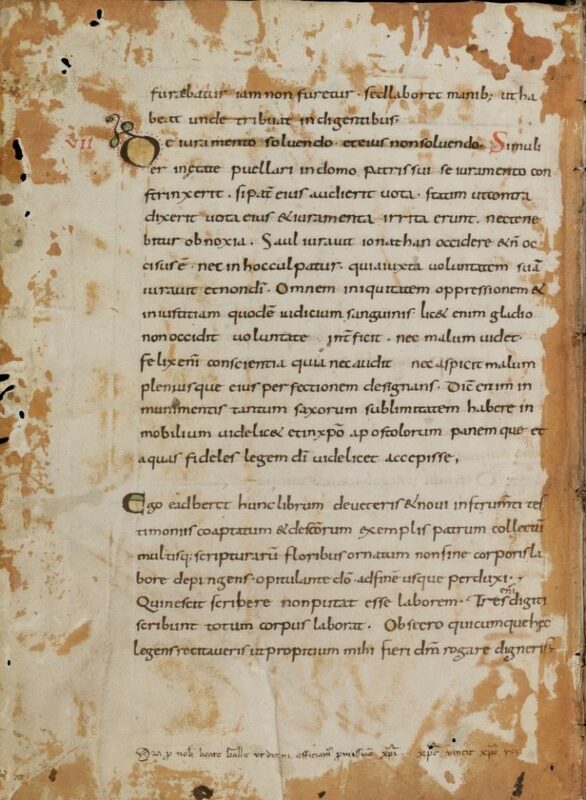 121-2), and an incomplete copy of Theodulf of Orléans’ first capitulary ad presbyteros parochiae suae of 797 (fols. 122-133). It is now, in its entirety, available on Gallica, but (again) useful as online digitised manuscripts are, this does not allow for the following codicological observation. 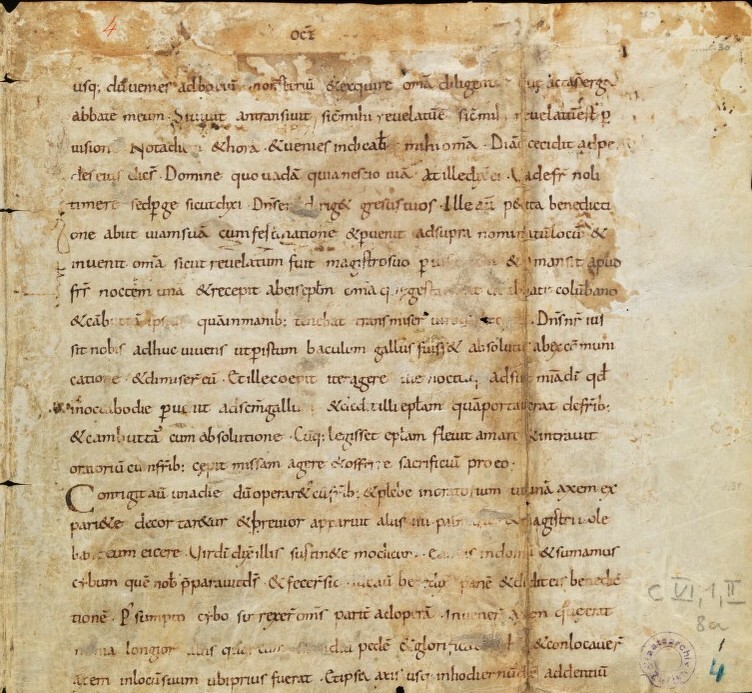 Sometime in the middle of the eleventh century, the St-Gall monk known to us as Ekkehart IV (c. 980-c. 1060) set down to write a continuation to the century-old chronicle of his monastery, the Casus Sancti Galli. His continuation took the form of a series of anecdotes about key figures in the history of his monastery, starting with the combative bishop and abbot Salomo. Early in the text, while introducing the background of Salomo, Ekkehard shares an anecdote about the most famous couple of Irishmen to visit the monastery of St-Gall in the ninth century. These two men are the Irish bishop Marcus and the son of his sister, Moengal, whom the monks of St-Gall quickly renamed Marcellus. They appeared on the monastery’s doorstep sometime between 849 and 872, on their return trip from Rome. The monks invite the Irish bishop to stay for a while, but it would seem that their main target was recruiting his nephew, who, Ekkehard says, was most learned in religious as well as secular scholarship (‘in divinis et humanis eruditissimus’). After some deliberation they both decided to remain at St-Gall with some Irish-speaking servants. Their money, horses, and mules were given to their companions who would continue travelling back to Ireland, but Marcus is said to have kept his books, gold, and costly vestments (‘pallia’) for himself and for St Gallus (‘sibi et sancto Gallo retinuit’). The phrase ‘for himself and for St Gallus’ can either mean that some of Marcus’s books were donated to the monastery while he held on to others, or that an arrangement was made that the possessions of the Irish bishop would fall to the abbey after Marcus’s death. Either way, this phrase constitutes the only explicit mention of an Irish traveller providing St-Gall with books. It is a point worth stressing; there is no other evidence of Irishmen giving books to the monastery of St-Gall. And even in this one instance, we are left with many remaining questions: for instance, we don’t know how many books Marcus actually had on him during his travels, where these books originated, how Marcus had obtained them (some perhaps brought from Ireland, but others were probably collected during his travels), or which texts they contained.